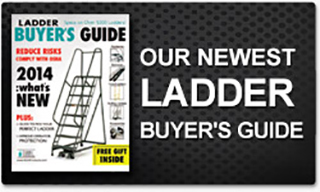 Collapsible Bins | EGA Products, Inc. The original custom design and fabrication of these unique storage vessels came about through EGA’s tireless drive to build the right thing(s) for their clients. 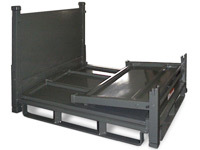 Produced and manufactured for a nationally known engineering and technology firm; these Collapsible Storage Bins provide easy storage and improved return shipping density when not in use. The concept of these industrial storage bins was born out of the need to cradle and store delicate parts so that they can be shipped densely, without marring paint-ready finishes, and with no need for bubble wrap, tie downs, etc. 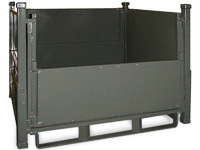 The bins have dual half-dropdown gates and solid steel decks. Typical industries served for this type of storage and cartage solution are automotive, construction, manufactured goods, shipping & handling. 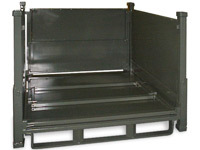 Rely on EGA precision engineering and manufacturing expertise to design and build custom bins like these, and other equipment that will meet the specific people-access, materials-handling, or storage needs of your industry and its processes—no matter how simple or complex your requirements.